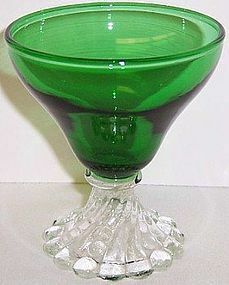 This pretty Royal Ruby Red Boopie 5 1/2 inch Footed Water Tumbler was made by Anchor Hocking. The Tumbler is in very good condition with no chips, cracks or scratches. 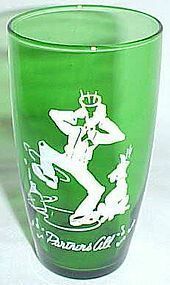 Be sure to search our other Anchor Hocking glass available. We guarantee all items to be as described. Feel free to email any questions. THANK YOU. 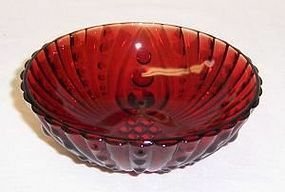 This really pretty Royal Ruby three Footed Burple 4 1/2 inch Fruit or Berry Bowl was made by Anchor Hocking. 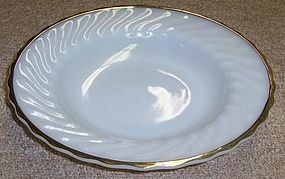 This Bowl measures 1 1/2 inches high and is in very good, unused, condition with no chips, cracks or scratches. Be sure to search our other Fire King available. We guarantee all items to be as described. Feel free to email any questions. THANK YOU. This pretty Fire King Grey Laurel Creamer and Sugar Bowl set was made by Anchor Hocking from 1952 to 1963. The Creamer and Sugar Bowl each measure 3 1/8 inches high and are in very good condition with no chips, cracks or scratches. They are signed FIRE KING OVER WARE Made in U.S.A. We guarantee all items to be as described. Feel free to email with any questions. THANK YOU. This really pretty Forest Green Charm Creamer and Sugar Bowl Set was made by Anchor Hocking from the 1940s to the 1960s. The Creamer and Sugar measure 2 1/2 inches high X 3 1/8 inches square. They are both in very good condition with no chips or cracks. Be sure to search our other Fire King available. We guarantee items to be as described. THANK YOU. 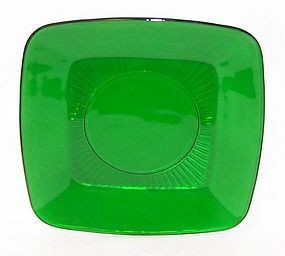 This is a really pretty Forest Green Charm 8 3/8 inch Square Luncheon Plate made by Anchor Hocking from the 1940s to the 1960s as part of their Fire King line. The Plate is in excellent condition with no chips, cracks or scratches. The surface of the plate is very shiny. Be sure to search our other Fire King available. We guarantee items to be as described. THANK YOU. 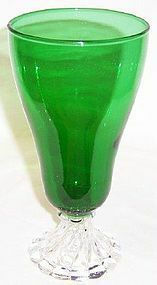 This pretty Forest Green, crystal foot, Burple 14 Ounce Ice Tea Tumbler was made by Anchor Hocking into the 1960s. 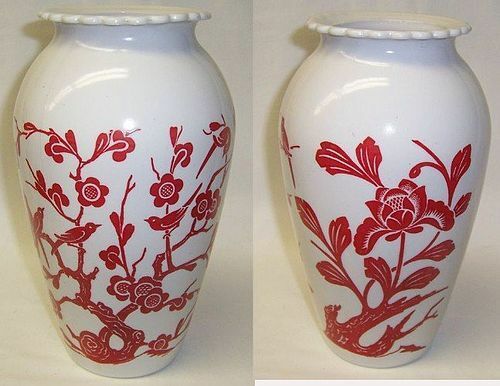 This Tumbler measures 6 3/4 inch high and is in very good condition with no chips or cracks. Be sure to search our other Fire King available. We guarantee items to be as described. THANK YOU. 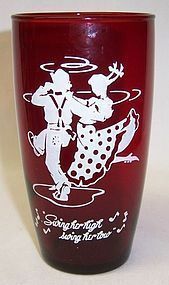 This really nice Royal Ruby Red 5 1/4 inch Tumbler, Swing Her High Swing Her Low decoration, was made by Anchor Hocking. This Tumbler measures 2 3/4 inches in diameter at the top and is in very good condition with no chips or cracks. The painted decoration is all very good. Be sure to search our other Anchor Hocking items available. We guarantee items to be as described. Please email any questions. THANK YOU. 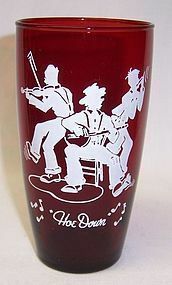 This really nice Royal Ruby Red 5 1/4 inch Tumbler, Hoe Down decoration, was made by Anchor Hocking. 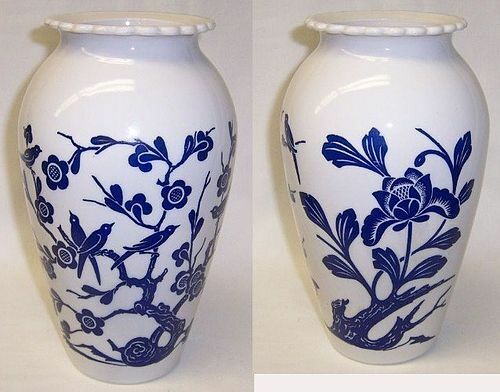 This Tumbler measures 2 3/4 inches in diameter at the top and is in very good condition with no chips or cracks. The painted decoration is all very good. Be sure to search our other Anchor Hocking items available. We guarantee items to be as described. Please email any questions. THANK YOU. This pretty Forest Green large Ice Tea Tumbler was made by Anchor Hocking. The Tumbler measures 6 3/4 Inches high. 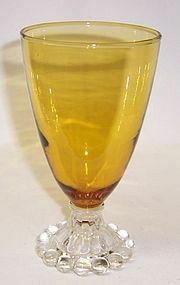 It has gold decorations around the top with white grapes and leaves decorating the lower part of the tumbler. It is in very good condition with no chips or cracks. The decorations are all very good. Be sure to search our other Fire King available. We guarantee all items to be as described. Feel free to email with any questions. THANK YOU. 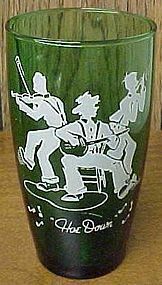 This really great Forest Green 5 1/4 inch Tumbler, Hoe Down decoration, was made by Anchor Hocking. This Tumbler is in very good condition with no chips or cracks. The painted decoration is all very good. Be sure to search our other Fire King items available. We guarantee all items to be as described. Feel free to email with any questions. THANK YOU. 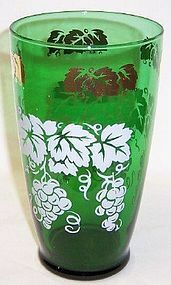 This really great Forest Green 5 1/4 Inch Tumbler, Partners All decoration, was made by Anchor Hocking. This Tumbler is in very good condition with no chips or cracks. The painted decoration is all very good. Be sure to search our other Fire King items available. We guarantee all items to be as described. Feel free to email with any questions. THANK YOU.